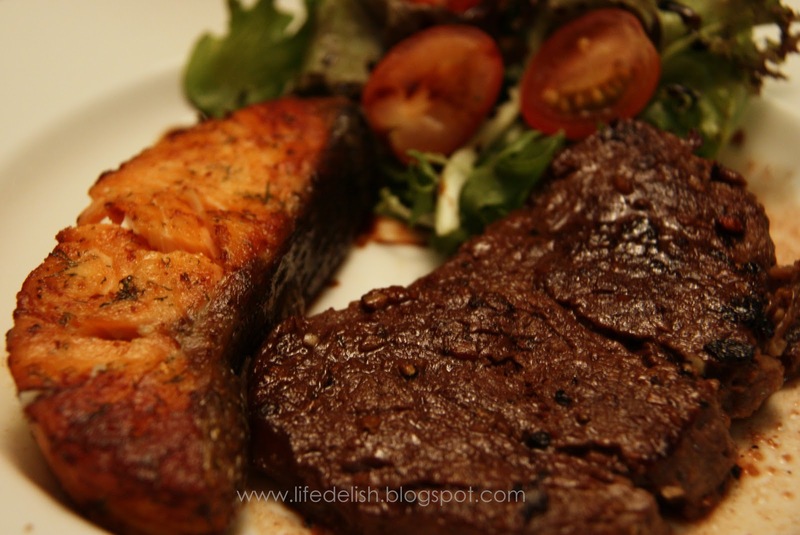 This was a quick and easy Steak and Salmon dinner we had some weeks back, decided upon on a whim at the supermarket because both the salmon fillet and beef tenderloin happened to be marked for “Quick Sale”. So we grabbed four of each. We actually eat quite a bit of salmon at home because it’s just such a delicious fish, packed with Omega-3, and pretty easy to prepare. Anyway, we all thoroughly enjoyed this meal. And the satisfaction I got out of it was doubled by the fact that it was done on such a whim. We had a side of boiled potatoes tossed in sour cream and bacon bits too. Boil a pot of water, with 1 tbs of salt added. Pre-heat oven to 220 deg celsius. Pat steaks dry with paper towels, rub salt, black pepper and about a teaspoonful of chopped garlic over each steak. (I usually have some chopped garlic in the fridge stored in an airtight glass jam jar). Rub salt, olive oil and dried dill over the salmon fillets. Heat skillet with 2 tsp olive oil, over medium-high heat. Put 4 or 5 potatoes into the pot of boiling water. Leave them to cook while you deal with the salmon and steak. Arrange salmon fillets in a oven-proof dish and bake at 220 deg celsius for approximately 8-10 minutes, then turn oven up to 240 deg celsius for approximately 4-6 minutes so that the edges and skin brown (How long it takes depends on thickness of the fillets and also how you like your salmon done. I like mine done medium, with the insides just flaking yet moist. The one in the picture is well-done). While the salmon fillets are in the oven, you can grill your steak in the skillet. Cook steaks one side at a time, approximately 3-4 minutes on each side, for medium done-ness. (Turn down the heat once the steaks are browned if you don’t want them too charred). Remove potatoes from pot once you can prick a fork into them without much resistance, then peel skins once they’re cool enough to handle, and halve or quarter them. Toss potatoes in sour cream, top with bacon bits (this was one of those times we used Hormel) and chopped chives. Sprinkle salt and black pepper over the steaks before serving. Sprinkle black pepper over salmon fillet. Serve with mesclun mix and cherry tomatoes, drizzled with olive oil and balsamic vinegar. We used a Raspberry Balsamic Vinegar reduction from a bottle we got from Jones the Grocer, which was pretty good.